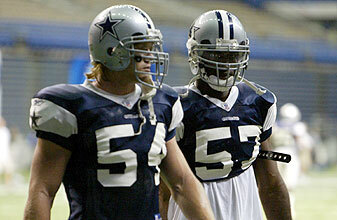 Josh Ellis profiles Kevin Burnett, the 2nd round pick for the Dallas Cowboys in 2005 and Bobby Carpenter, their 1st round pick in 2006, both of whom look like backup linebackers for the foreseeable future. Burnett and Carpenter appear to be progressing just fine, and coaches have shuffled the two from inside linebacker to outside and back again trying to find the best way to use them, but the Cowboys are essentially set with their starting linebackers in the 3-4, having doled out big contracts to Bradie James, Akin Ayodele, DeMarcus Ware and Greg Ellis in recent years. Carpenter and Burnett are making good money too, a sign of the Cowboys initial commitment to them. So is the pair’s inability to break into the starting lineup a fault of their own, or a sign of failure within the organization to draft useful players? After all, first and second-round picks are supposed to be starters, not the immediate backup inside linebackers, right? Team owner and general manager Jerry Jones disagrees, suggesting depth chart positioning doesn’t matter, that high picks are paid to make plays, and Burnett and Carpenter have been doing just that. “I submit to you that if we get Carpenter playing like he did in the Seattle game, which we have every reason to expect, if we get a Kevin Burnett that can make plays like the interception that he had against Indianapolis, those are worth ones and twos,” Jones said. Cowboys defensive coaches don’t seem to mind having high picks as backups at the linebacker position, which is probably the deepest on the team. There’s some logic to that and, certainly, linebackers are key to the 3-4, as the Cowboys learned when Ellis went down late last season and the wheels came off. Still, in a salary cap world, there’s only so much depth a team can afford. Paying first round picks to sit on the bench necessarily deprives it of quality starters at other positions. It’s not as if the Cowboys couldn’t use help at cornerback or wide receiver. While Jerry Jones and Wade Phillips went into the recent draft saying there were no holes they just had to fill, this is a team that fell apart in the second half of the season and only made the playoffs because six teams from each conference have to. That’s not the mark of a team that should be spending 1st and 2nd round picks on backups.